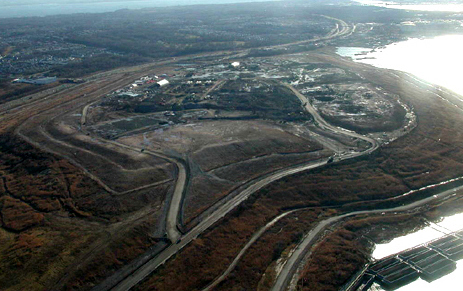 World Trade Center site, looking north - 9 months after Mohammed Atta flies American Airlines Flight 11 into North Tower, resulting in collapse. 1,642,698 tons of debris have been removed - including 190,568 tons of steel in 108,342 truckloads, involving more than 3.1 million hours of labor. 2,823 people were killed, 19,500 body parts collected, 1,092 victims identified. 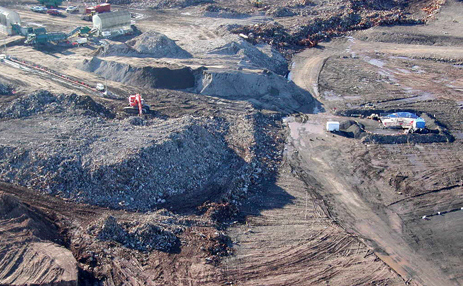 Investigative site atop Fresh Kills landfill (left), and detail of debris mound (right) where materiel was sifted for human remains after removal from WTC. Can you remember the first time that you met Mohamed? Yes we met in a seminar about planning and building in development countries at the University and Mohamed was very interesting person for me cause I've been in Egypt and Palestine two times before and this was a good opportunity to get more informations and to get better impressions of this country I have travelled before. We began to work together at the end of 1994 and we prepared a journey to Syria to Aleppo where we studied life and structure of the old city of Aleppo. A very characteristic old city. It's comparable only with the old city of Cairo and these were the main interest of Mohamed, the traditional structure and the daily life, the mixture of traditional structure and actual daily life in these old Islamic inner cities of Aleppo and of Cairo because he was interested in the specific structure of these old cities. In former times, there was no separation of political and religious life in Arabia. In the western world, we have the separation of the political life on the one side and the religion on the other side and in former times, also in Europe, but in former times in Arabia, this was some kind of unity, Mohamed told me and these old cities and these Islamic old cities you get a very lively impression how the daily life may have been from the time. This was the main interest of Mohamed. He studied the German language with very much discipline and he spoke very fine or his knowledge of German language was excellent. Mohamed Atta lived in Hamburg from 1992-2000, during which time he studied urban planning at the Technical University of Hamburg-Harburg. Investigators believe that he met fellow hijackers Marwan Al-Shehhi and Ziad Jarrah through an Islamic student group he founded at the university in 1999. Atta visited Syria several times from 1994 to 1999. He spent several weeks in Aleppo during August 1994 conducting research for what would eventually be his thesis about the renewal of part of the old quarter of Aleppo in Syria. Atta returned again in December, making contact with members in the committee of the project to revive old Aleppo. Atta obtains a visa to study in Hamburg at the Technical University of Hamburg-Harburg (TUHH). He enrolls in a degree in urban planning in the faculty of engineering. The last picture of Atta is taken around 5:45am at the airport in Portland, Maine, as he passes through security before boarding a flight to Boston. At 7:59am, American Airlines Flight 11 departs Boston for Los Angeles, with Atta and Al-Omari on board. At 8:45am the plane strikes the northern tower of the World Trade Centre.